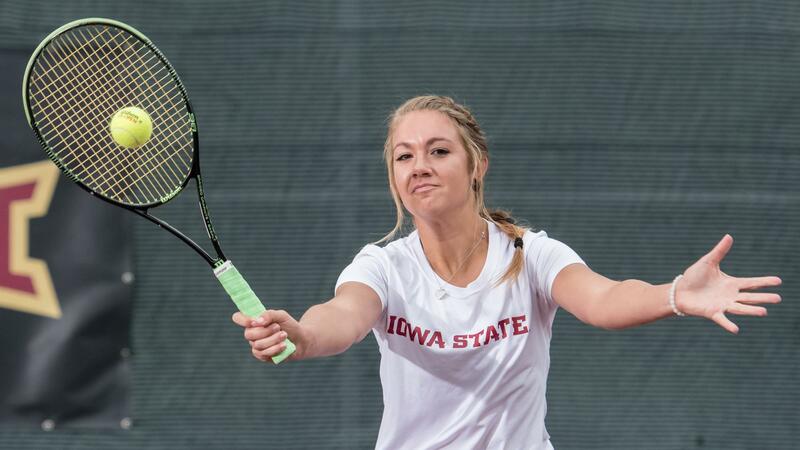 MANHATTAN, KS- The Iowa State tennis team (15-2, 1-0 Big 12) fell to the Kansas State Wildcats (9-8, 0-2 Big 12), 4-0, Friday at the Body First Tennis Center. The loss snapped a 12-match win streak for the Cyclones and also the first loss in Big 12 play. The Wildcats got off to a fast start by clinching the doubles point with victories in their number two and three double pairings. They used that momentum to carry them into singles play to give the Cyclones their first loss since February 5. Samantha Budai was the lone Cyclone to win a set against the Wildcats. Carolina Costamanga defeated her 6-3, 3-6, 6-3 to secure the 4-0 win for Kansas State. The Cyclones will look to get back on track against the Kansas Jayhawks (9-4, 1-1 Big 12) on Sunday at noon at the Jayhawk Tennis Center. Follow @CycloneTEN for all the most up to date information as the weekend progresses.